The Conrad London is London's only 5-star all-suite hotel overlooking the marina in Chelsea harbour and the river Thames. The facilities complement the excellent location. At the Conrad London you will enjoy a luxurious air-conditioned suite with sitting room, bedroom, bathroom and hallway- fully-equipped for the business and leisure travellers. Six beautifully appointed penthouse suites offer superb views over the harbour and river Thames. All have complete 24-hour security. Equally impressive are the 14 conference rooms for up to 200 people. Each conference room offers state-of-the-art facilities for all sizes and styles of conventions. 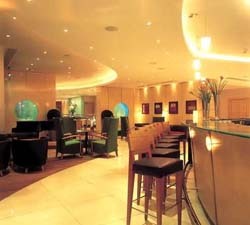 The Conrad London ambience is warm- relaxed and welcoming. All day sustenance is provided by Aquasia restaurant- bar and terrace. For the energetic there is a 17 metre pool and fitness centre while for the less energetic, there is a solarium and a masseuse. For the visitor to London the Conrad London represents a remarkable marriage of location and facilities.